The Supercopa de España or the Spanish Super Cup is a Spanish football championship contested by the winners of La Liga and the Copa del Rey. In the event that a team wins both La Liga and the Copa del Rey, the runners up of the Copa del Rey will play against the winner of La Liga and the Copa del Rey. The current competition has only existed since 1982, but between 1940 and 1953, several other tournaments between the Spanish league champions and the cup winners (then Copa del Generalísimo) were played. In 1940, it had the name of Copa de Campeones and 1941 the Copa Presidente FEF. 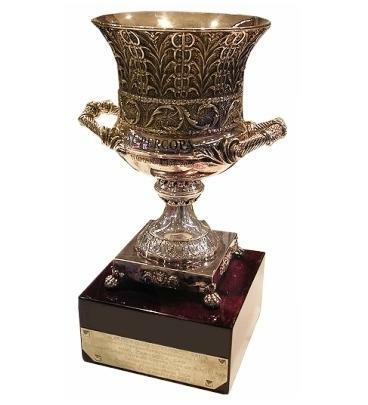 It was not played again until 1945, when the Ambassador of Argentina, due to the good relations with the Spanish military government, offered a trophy called Copa de Oro Argentina. In 1947, the Copa Eva Duarte de Perón was established as an annual tournament, as a tribute to the President of Argentina and his wife, the popular Evita. They were played between September and December, usually as one-match finals. Lionel Messi has the most goals scored by a player in the Spanish Super Cups with 11 goals. 1945 Barcelona 1944–45 La Liga Athletic Bilbao 1944–45 Copa del Generalísimo 5–4 Copa de oro "Argentina"
1952 Barcelona 1951–52 Liga & Copa Awarded automatically for winning the Double. 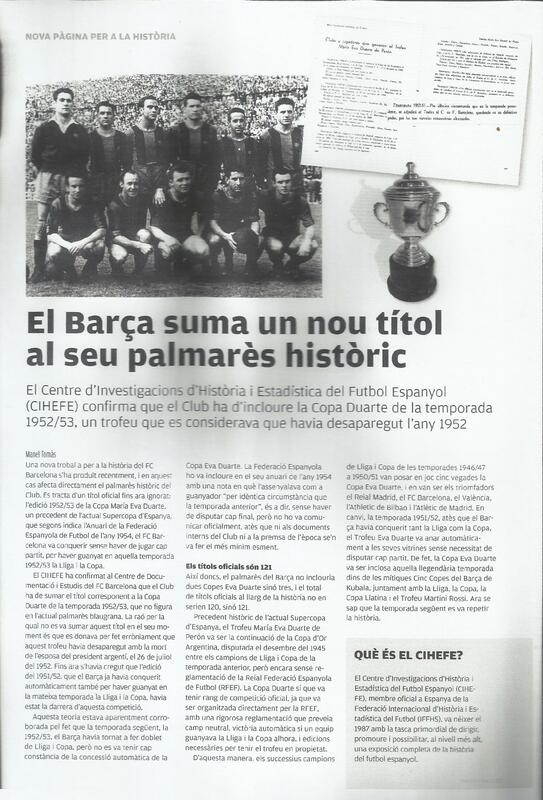 * In 1952  the cup was awarded to FC Barcelona, as they had won the La Liga / Copa del Generalísimo double. Except for the 1983, 1988 and 1992 tournaments, the first leg match was played always at the Cup winner's stadium. 1984 Athletic Bilbao 1983–84 Liga & Copa Awarded automatically for winning the Double. 1986 Real Madrid and Zaragoza did not play. 1987 Real Madrid and Real Sociedad did not play. 1989 Real Madrid 1988–89 Liga & Copa Awarded automatically for winning the Double. Lionel Messi has scored the most goals in the history of Spanish Super Cup, a total of 11 goals. - Lionel Messi has scored in 5 different editions of the Spanish Super Cup (2009, 2010, 2011, 2012 and 2015). He is the only player to have done so in the history of the competition. - Lionel Messi has scored in 4 consecutive Spanish Super Cup editions (2009, 2010, 2011 and 2012). He is the only player to have done so in the history of the competition. This page was last modified on 2 January 2016, at 18:07.